Location: Northeastern Romania - between the Carpathian Mountains and the Prut River. Bucovina is situated in the northern part of the region of Moldova, bordering with Ukraine. Moldova rivals Transylvania when it comes to rich folklore, natural beauty and astonishing history. Over the past 500 years, history, culture and religious life have molded Iasi, the cultural capital of Moldova. Iasi boasts an impressive number of Orthodox churches, almost 100, most of them located in the Golden Plateau, representing the nucleus of the city, around which the city developed over the centuries. One of the most famous monuments in the city is the stunning Church of the Three Hierarchs, built in 1639. Another major landmark in Iasi is the neo-gothic Palace of Culture, built between 1900-1926, currently housing the Ethnographic Museum, the Art Museum, and the History Museum of Moldova. Nestled in the rolling hills of northern Moldova is the region of Bucovina, home to one of the world's greatest art treasures: the UNESCO World heritage sites of the Painted Monasteries of Bucovina. Built in the 15th and 16th centuries and featuring colorful exterior frescoes depicting dramatic religious scenes, these richly decorated houses of worships are unique in the world. The most famous of these, often called "the Sistine Chapel of the East" is Voronet Monastery. Erected in 1438 by Stefan the Great, Voronet's most stunning feature is a Last Judgment fresco painted – as at all the churches – on the exterior façade. The blue paint that has miraculously never faded is known throughout the world as 'Voronet blue'. The artists here worked in isolation, guarding their trade secrets and to this day, the composition of the paint remains a mystery. Other painted churches not to be missed include Sucevita, with its distinctive greens, and Humor, where the frescoes are predominantly red. Also nearby are, Arbore, Dragomirna, Moldovita and Putna monasteries. The town of Suceava, may be the best starting point for a trip to the monasteries. Once the capital of Moldavia (from 1375 until 1565), it has some noteworthy attractions of its own, such as the remains of the Fortress of Suceava built in 1388. Today, visitors can tour the remains of the impressive fortifications and take in a great view of the city. Other sights in Suceava include the St. George Church (UNESCO World Heritage Site), Mirauti Church, the Zamca Monastery and a number of museums dedicated to woodcraft, ethnography, history and folk art. The Bucovina History Museum displays medieval armor, coins, tools and ancient documents. Its Hall of Throne is a re-creation of Stephen the Great's court with furniture, weapons and costumes. A visit to Bucovina would not be complete without some stunning nature walks through Ceahlau National Park, Romania's Olympus – the sacred mountain of the Dacians, the forefathers of the Romanian people. Make sure you bring binoculars as some 90 species of birds can be seen in the park area. Hikers won't want to pass up taking a crack at the Bicaz Gorges, a steep, twisting-and-turning climb more than three miles long. Neamt County is located in the central-eastern part of Romania. Neighboring counties are: Suceava, Harghita, Bacau, Iasi and Vaslui. Highest elevation: Ocolasul Mare Peak (Ceahlau Mountain) of 6,256 ft.
Neamt County is aa area blessed with many touristic sites: Century-old monasteries, fascinating museums, fortresses and strongholds as well as many natural parks ideal for hiking and wild-life watching. Monasteries Neamt - the oldest in eastern Romania (Moldova) and Agapia – featuring by Romania's best known painters: Nicolae Grigorescu at Agapia Monastery, the Ceahlau Mountain - also known as The Athos of Romanian Orthodoxy - the beautiful and spectacular Cheile Bicazului (Bicaz Gorges) Vanatori natural reserve are all located in Neamt. Cucuteni Culture Museum (Piatra Neamt) - a museum that displays an impressive collection of painted ceramics. The Museum of Agapia Monastery - founded in 1927 displays religious objects, paintings, fabrics and wooden sculptures. Here you'll also see some of the paintings of painter Nicolae Grigorescu. Vanatori Park - famous for its bison and Carpathian wildlife reserve and the hiking routes connecting the monasteries located in Targu Neamt area. 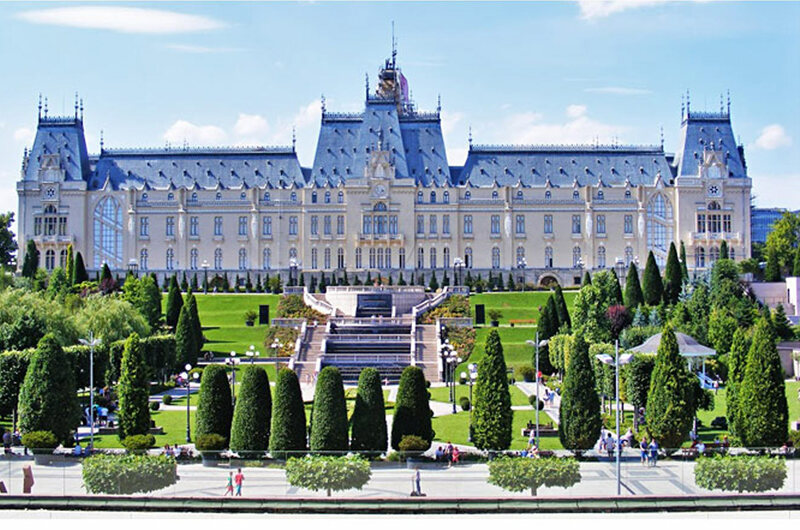 Tourist attractions include: Neamt Monastery, Icoana Noua Refuge, Dragos Voda bison and Carpathian wildlife reserve, Sihastria Monastery, Secu Monastery, Sihla Refuge, The Cave of Saint Teodora, Agapia Monastery and Varatec Monastery. Cheile Bicazului - Hasmasu Park - This is one of the most spectacular touristic areas in Romania. 18 hiking routes in the park offer access to the following tourist attractions: Lacul Rosu (The Red Lake), Cheile Bicajelului (Bicajel Gorge), Cheile Laposului (Lapos Gorge), Mt. "Piatra Altarului", Barnadu Village (a remote community behind the massive stone walls of the gorge), Bicajel Valley. Cozla Mountain - located in Piatra Neamt. Access to the top of the mountain - which offers panoramic views of the city of Piatra Neamt and Ceahlau Mountain – is possible by foot and by gondola (cable car). Hiking, biking, skiing and wildlife watching. The Ceahlau, Romania's Olympus – sacred mountain of Dacians, the forefathers of the Romanian people, where Zamolxes, their supreme god, had his temple. Bean soup, stewed sauerkraut, parjoale (the local version of meatballs) or iahnie (a dish made of beans), are some of Moldavians' favorite dishes. Standing out among the soups and broths is ciorba de potroace, made with chicken entrails boiled with carrots, onions, parsley, a spoonful or two of rice and flavored with bors. The Moldavian sarmale (meat rolls in sauerkraut leaves) are not only very popular in Romania but are also a famous dish served in Romanian restaurants around the world. These meatballs, rolled in cabbage or vine leaves, are made from minced pork mixed with rice, salt, pepper, chopped dill and parsley as well as chopped onion; small portions of this mixture are then rolled in cabbage or vine leaves and boiled. The sarmale are always accompanied by polenta, a finely ground yellow cornmeal. Local deserts include papanasi – cottage cheese dumplings (boiled or fried) and Poale in Brau(sweet cheese pie). Located in the small village of Cotnari, the Cotnari vineyards are famous for their delicious sweet white wines made of grapes rich in sugar and harvested in late autumn following the first frost. The quality of these wines relies on a combination of rich soil, the late harvest and the presence of a special mold (Botritis cinerea). The vineyards have a long history, spanning over seven centuries. The winery's most popular wines include Francusa (dry), Feteasca Alba (semi-sweet) - highly appreciated for preserving the flavor and freshness of the grape; and the sweet, golden Grasa and Tamaioasa dessert wines. Grasa de Cotnari is a naturally sweet wine with a delicate fragrance and a smooth interplay of fruitiness and acidity. Tamaioasa Romaneasca - a sweet or semi-sweet white wine - has subtle honey and basil aromas, an exquisite amber color and a persistent rich taste. Its sweet taste may also suggest a blend of rose petals and wild-berries. Moldova is also home to another well-know vineyard, Odobesti, one of largest and oldest in Romania. There are written references to the Odobesti wine growing region dating from the 17th century. Among the wines produced at Odobesti are six varieties made from native grapes, namely: Galbena de Odobesti, Plavaie, Feteasca Alba, Feteasca Regala (white grapes) and Babeasca Neagra (red). Galbena de Odobesti – is a light, white, wine with a delicate bouquet that preserves the fragrance of the mellow grape. Babeasca Neagra - is a full-bodied red wine with a delicate bouquet and a slight taste of clove. The Bucium and Copou vineyards are set in the very hills that surround the city of Iasi. Bucium's wine-production centre also includes an interesting wine-growing and production museum and a wine tasting room. The nearby restaurant Perla Viilor serves local, rustic, cuisine. One of the most appreciated wines produced by Bucium winery is the sparkling obtained from gently-pressed Muscat-Ottonel grapes, which ensures a lower concentration of alcohol, sweetness, delicacy, and prolonged sparkle. The vineyard features the Beciul Domnesc (Princely) Cellar, erected here in 1839, with a collection of more 100.000 bottles of old wines. A visit to Panciu vineyard also includes a walk among the vineyards to the famous Panciu Royal Cellars, dating from the 1400s, where numerous bottles of sparkling wines and champagne perfect their taste. Wines Tamaioasa Romaneasca, Feteasca Alba, Feteasca Neagra, Busuioaca de Bohotin. Nearest City Bucharest, Braila, Galati. Wines Feteasca Neagra, Babeasca Neagra, Cabernet Sauvignon, Shiraz, Chardonnay, Pinot Gri, Feteasca Neagra. Labels Monser, Varius, Senator, Omnia, Suav, Glia. Wines Feteasca Regala, Feteasca Neagra, Sauvignon Blanc, Muscat Ottonel, Aligote, Babeasca, Merlot, Cabernet Saivignon. Labels Terra Vrancea, Tatal si Fiul, Reserve. Wines Băbească Neagră, Merlot, Fetească Neagră, Cabernet Sauvignon Blanc. Wines Feteasca Alba, Feteasca Regala, Cabernet Sauvignon, Italian Riesling, Feteasca Neagra, Babeasca Neagra, Merlot, Pinot Gris. Labels Castelul dintre Vii, Premiat, Dracula. Wines Sauvignon Blanc, Zghihara de Husi, Cramposie, Feteasca Regala, Babeasca Gri, Tamaioasa Romaneasca, Sarba, Busuioaca de Bohotin, Babeasca Neagra, Merlot, Cabernet Sauvignon, Feteasca Neagra. Wines Feteasca Alba, Feteasca Ragala, Merlot, Cabernet Sauvignon, Muscat Ottonel, Aligote. Labels Varancha, Ilvia, Epicentrum, Bacanta. Wines Chasselas Doré, Feteasca Regala, Merlot, Riesling Italian, Aligote, Sarba, Galbena de Odobesti. Wines Feteasca Neagra, Babeasca Neagra, Babeasca Rose, Tamaioasa Romaneasca, Sauvignon Blanc, Chardonnay, Aligote, Cabernet Sauvignon, Muscat Ottonel. Wines Galbenă de Odobeşti, Sauvignon Blanc, Riesling de Rhin, Traminer, Şarbă, Merlot. Wines Feteasca Regala, Riesling Italian, Babeasca Gri, Feteasca Alba, Merlot, Aligote. Labels Terra Vrancea, Tatal si Fiul, Reserve, Zebra. Wines Feteasca Alba, Aligote, Feteasca Regala, Italian Riesling, Merlot, Pinot Noir. Labels General Rascu, Gordiana, Mosconi. Wines Italian Riesling, Rhein Riesling, Traminer, Aligote, Muscat Ottonel, Chardonnay, Sauvignon Blanc, Zghihară de Huși, Șarbă, Galbenă de Odobesti, Fetească Albă, Fetească Regală, Tămâioasă Românească, Grasă, Busuioacă de Bohotin, Cabernet Sauvignon, Merlot, Pinot Noir, Fetească Neagră. Labels Ambrosio, Comoara Pivnitei, Casa Vrancea, Egregio, Mirabilis, Premiat. Wines Sarba, Feteasca Regala, Merlot, Muscat Ottonel, Italian Riesling. Labels Sauvignon Blanc, Feteacca Regala, Muscat Ottonel, Sarba, Riesling, Aligote, Cabernet Sauvignon, Merlot, Vinul lui Ureche - Cuvee Blanc, Vinul lui Ureche - Cuvee Rouge. Wines Muscat Ottonel, Aligote, Feteasca Alba, Merlot Rose, Merlot. Major airports in Bucovina and Moldova region: Suceava Airport, Bacau International Airport, Iasi International Airport. There are several daily trains and buses from to Bucharest and other major cities in Romania to Bucovina and Moldova regions. Main train stations: Iasi, Suceava, Gura Humorului. To check train and bus schedules for domestic routes please visit our: Romania Domestic Transportation section.